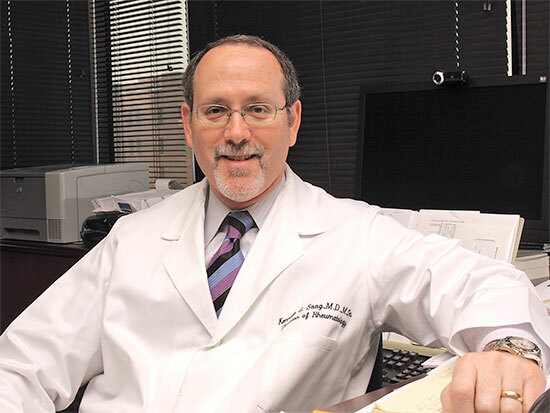 Kenneth Saag, M.D., M.Sc.The National Institutes of Health awarded the University of Alabama at Birmingham’s Division of Clinical Immunology and Rheumatology a $6.5 million grant to further investigate gout, hyperuricemia and other diseases associated with gout. The goal of the INSIGHT CORT is to conduct innovative translational research projects drawing on the unique strengths of multidisciplinary research teams at UAB, Harvard University, Brigham and Women’s Hospital, University of California San Diego, University of Otago in New Zealand, University of Nebraska Medical Center, and Michigan State University. S. Louis Bridges, M.D., Ph.D., Anna Lois Waters Endowed Chair of the UAB Division of Clinical Immunology and Rheumatology, and Hyon Choi, M.D., DrPH, professor of Medicine at Harvard, will serve as associate directors of the CORT. Projects within the INSIGHT CORT span the translational basic and pre-clinical spectrum from genetic and molecular underpinnings of hyperuricemia and gout to understanding how urate-lowering therapies for gout might preserve kidney function in gout patients. Collectively, these projects hold promise to increase the clinical understanding of gout and the factors that contribute to debilitating gout flares, providing critical information to the burgeoning field of precision medicine through investigations of novel biomarkers for gout flares and genetic predictors of responsivity to therapies available for gout. In addition to the four funded projects, the center will foster development of pilot and feasibility projects to encourage the use of new translational methods to research gout, hyperuricemia and associated comorbidities, such as chronic kidney disease and metabolic syndrome. The center will also oversee training activities to promote training of translational investigators in current methods of research applicable to gout and hyperuricemia.